Built in 1960, the Columbus Square pavilion is a strange structure halfway between castle turret and modernist hideaway. It stands as one of only a handful of Fleisher’s buildings still standing. A similar pavilion in nearby LOVE Park, nicknamed “the flying saucer” and built in the same year by architect Roy Larson and engineer Nicholas Gianopulos, is getting a $3M restoration. But unlike its sister, the Fleisher pavilion is scheduled for demolition as part of Columbus Square’s renovation. 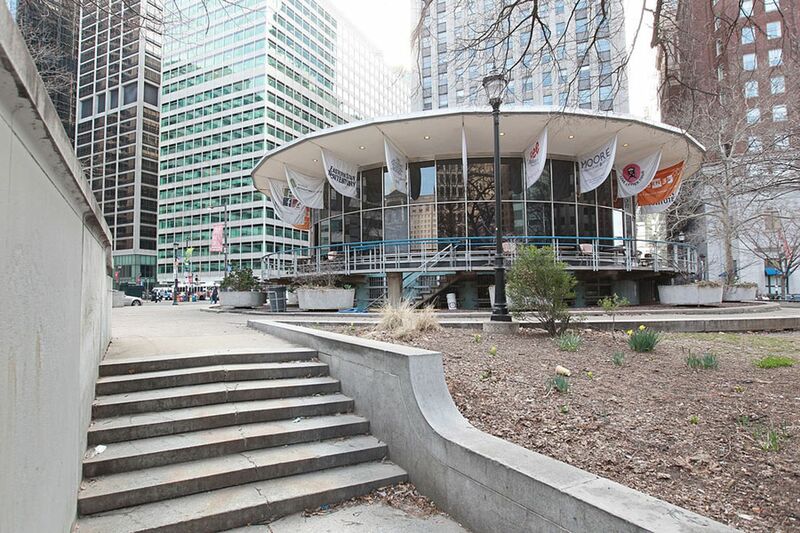 Built in the same year as Fleisher’s building, the LOVE Park pavilion has a different trajectory than its cylindrical sister, re-opening this spring after a $3M renovation. Photo by Michael Bryant / File Photograph. Read the whole article here, and make a trip to Philly soon to see the other remaining pieces of Fleisher’s legacy.